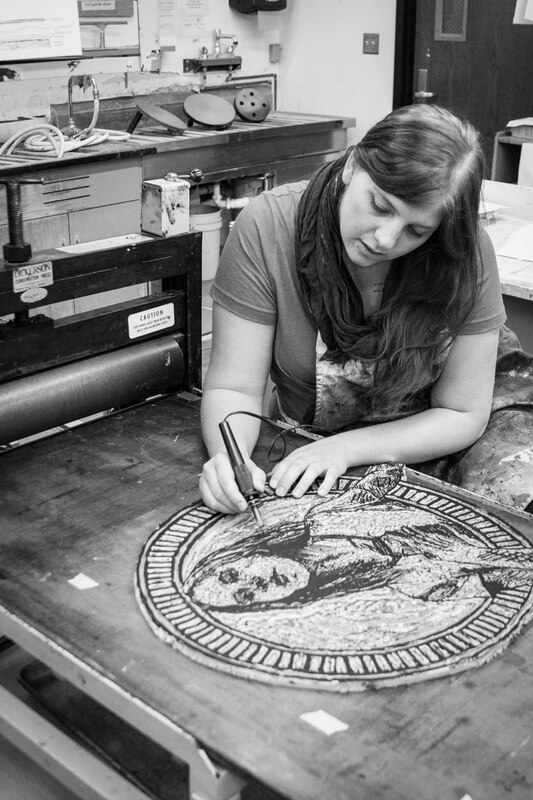 Elise Forer is a printmaker and teaching artist living and working in the Chicago area. A Minnesota native, Forer received her Bachelor of Fine Arts at Minnesota State University Moorhead (MSUM) in Moorhead, MN in 2013. In her time at MSUM she served as Studio Intern and Teacher’s Aide under John Volk in the printmaking studio, and the resident intern at the Hannaher Studio in the Plains Art Museum in Fargo, ND. Upon moving to Chicago she became a studio fellow at Spudnik Press in the program’s inception and has continued on to become an instructor with the organization. Forer’s work has been shown nationally, and her wheatpaste installation, “You belong among the wildflowers”, is currently on view at the Plains Art Museum in Fargo, ND and is the featured artist for the traveling show, "New Nordic Art", now on view at the Nordic Center in Duluth, MN.